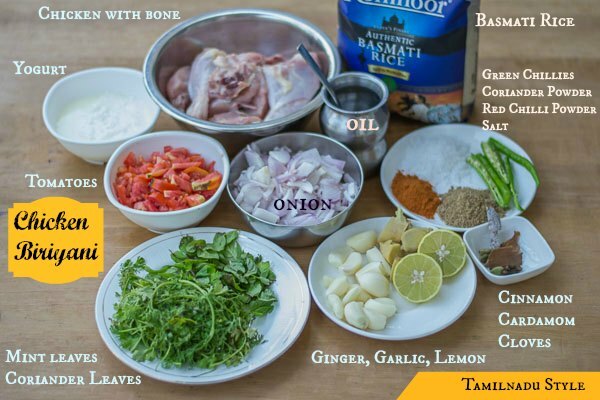 Recipe for Tamilnadu Style Chicken Biriyani. Very delicious. With step by step pictures. Thahira is a very close friend of mine living in San Diego. She is an amazing cook. I have eaten tonnes of this biriyani made by her. We fondly call it as baai veetu biriyani-பாய் வீட்டு பிரியாணி. My toddler calls Thahira’s husband Sadak as Abba and because Abba brings Tamilnadu Style Chicken Biriyani every time he comes home, he named the dish as Abba Mummum. Mummum is food. So even today he calls this Tamilnadu Style Chicken Biriyani as Abba mummum. We have had some wonderful memories that revolve around this Tamilnadu Style Chicken Biriyani. I miss her a lot after moving to India and this Tamilnadu Style Chicken Biriyani is filled with a lot of nostalgic memories. Biriyani made in Tamilnadu is different. The rice is not precooked. 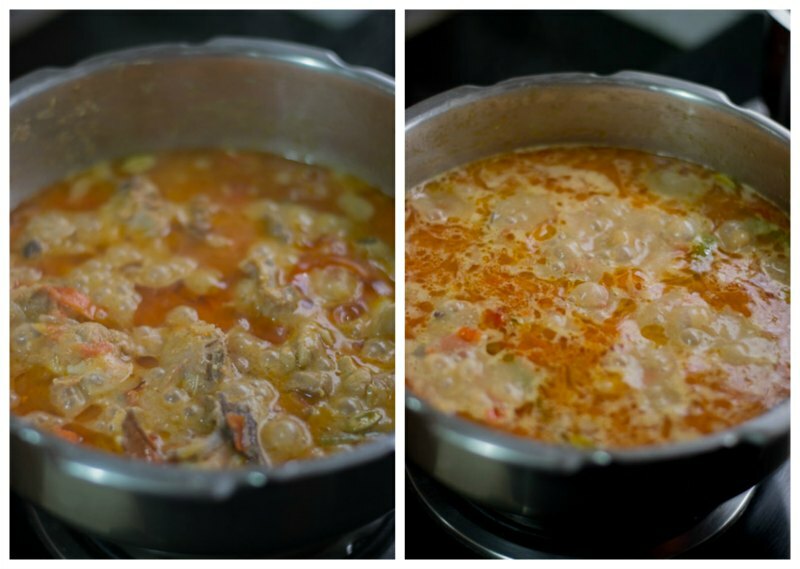 Its cooked along with the chicken and because of that the flavors penetrate deep into the rice. This is my kind of Tamilnadu Style Chicken Biriyani. 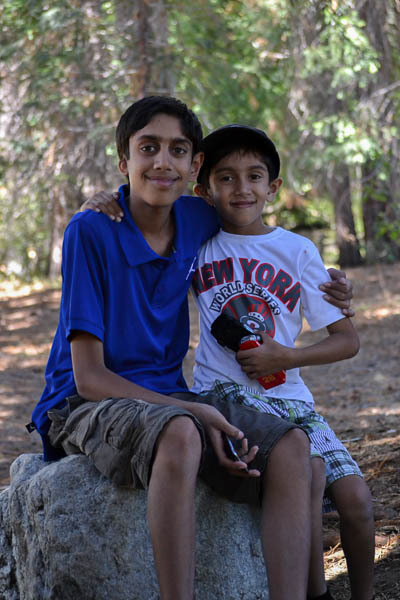 Thahira has two adorable sons Salman and Suhaib and the younger one Suhaib is my sons best buddy. Mine too. He is a rock star. I love you Suhaib. Here is the recipe for Tamilnadu Style Chicken Biriyani. You will need the following ingredients. Heat Oil in a pan and add in the spices. Cinnamon, Cloves and Cardamom. Add in the onions and saute until the onions are soft. 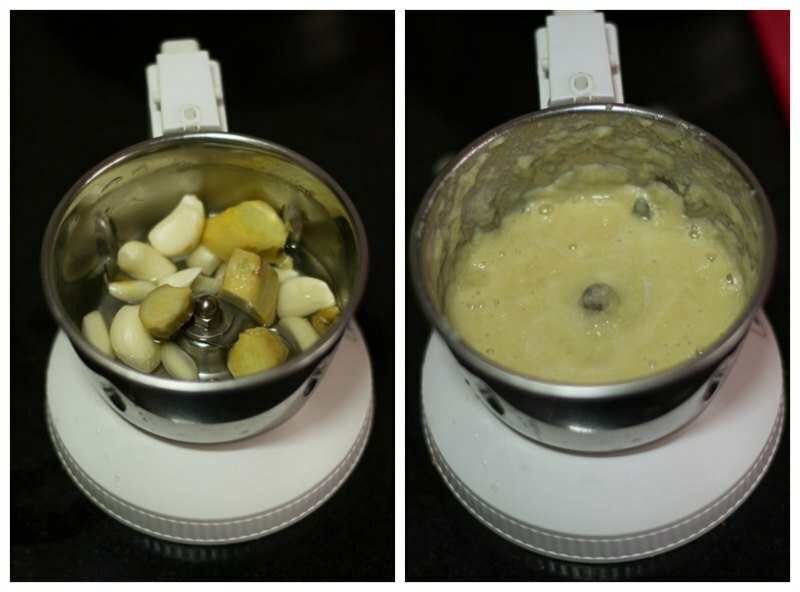 When the onions are sauteing, make a paste of ginger and garlic in a blender. Add up to 1/4 cup of water and grind it into a very smooth paste. 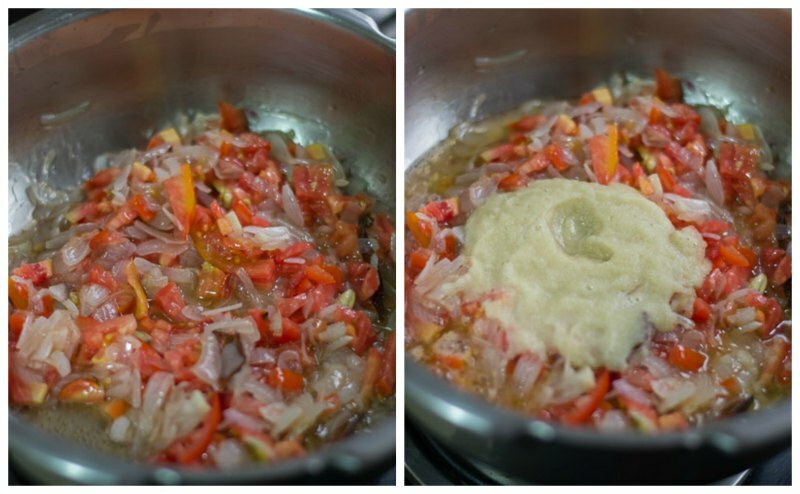 Once the onions are soft, Add in the tomatoes and the ginger garlic paste. Saute the mixture until streaks of oil appear on the top. 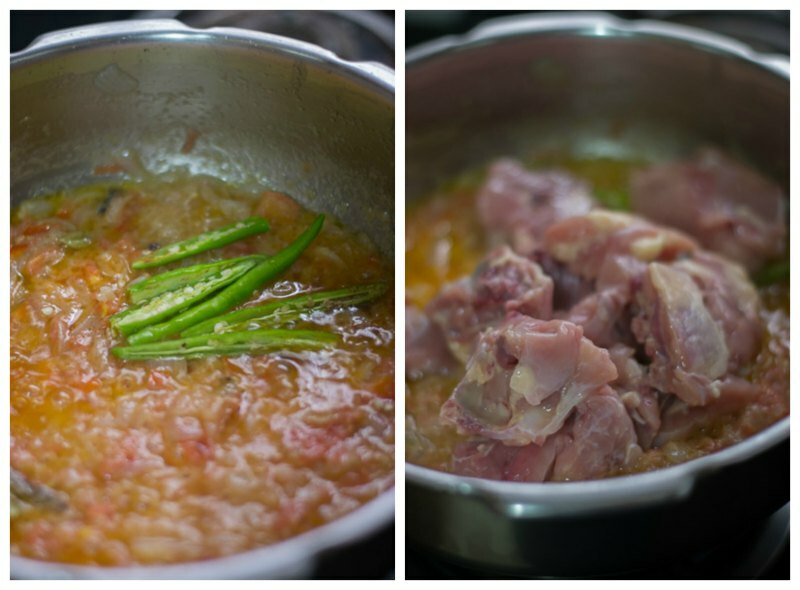 Then, add in the green chillies and the chicken. Add in the salt, red chilli powder and the coriander powder. Add in the yogurt. Briefly saute for a minute to coat the chicken. Cover the pan with a lid and cook on medium flame for 7-8 minutes. Do not add any additional water. Saute once in a while to avoid scorching at the bottom. When the chicken is cooking, soak the rice in cold water. After 8 minutes, the chicken should be almost cooked. 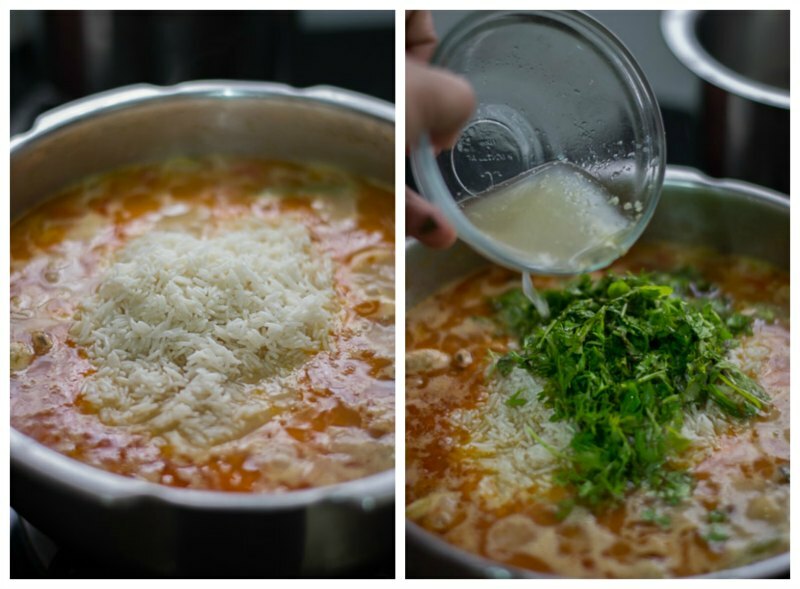 Remove the cooked meat to a bowl and roughly measure how much liquid is left behind. Mine had about 1.5 cups of liquid. Just measure roughly. It need not be accurate. 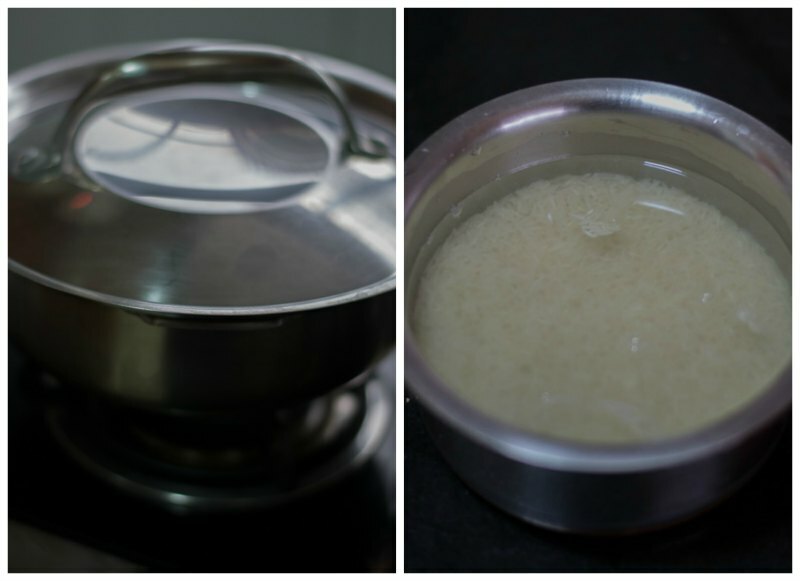 Measurements used – 1 cup rice = 250 ml We are using 2 cups rice and 750 grams meat. We require 2 times water to the quantity of rice. So we need to add 4 cups water. There was already 1.5 cups gravy that we measured before. So I added 2.5 cups water to the mixture. Add back the meat. Let the mixture come to a boil. Drain the rice and add it to the pan. Add in the coriander leaves, mint leaves and juice of a lemon. I cooked the Tamilnadu Style Chicken Biriyani in the pressure cooker. If using pressure cooker, cover the lid and cook for exactly two whistles on medium flame. Approximately 4-5 minutes. If cooking directly on the pan, then cover the pan with a lid and let it cook for the first four minutes on medium flame. Open the lid. Gently mix once from the bottom, cover the lid again and simmer for 10 minutes on very low flame. Remove the pan from heat and set aside. Wait for the pressure from the cooker to release naturally. If cooking in a pan, Do not disturb for the next 20 minutes. The rice will get swollen and absorb all the left out moisture. This time is very important. Do not rush. Serve hot! Enjoy your Tamilnadu Style Chicken Biriyani. If I was with Thahira, she would say Bismillah ! 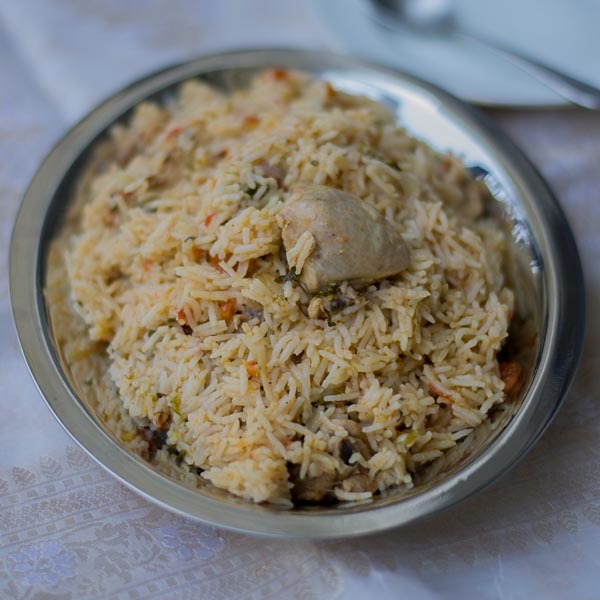 Tamilnadu Style Muslim Chicken Biriyani – தமிழ் பாய் வீட்டு கோழி பிரியாணி Measurements used - 1 Cup = 250 ml. Saute the mixture until streaks of oil appear on the top. 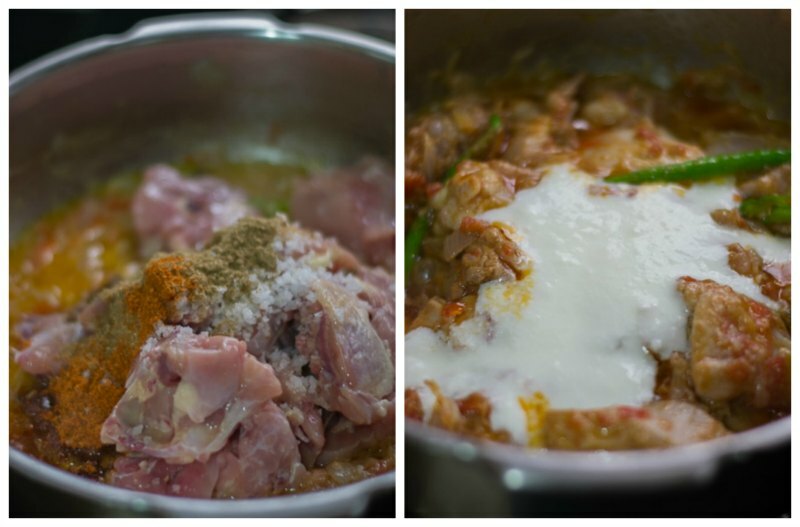 Then, add in the green chillies and the chicken. Briefly saute for a minute to coat the chicken. Add in the salt, red chilli powder and the coriander powder. Add in the yogurt. Cover the pan with a lid and cook on medium flame for 7-8 minutes. When the chicken is cooking, soak the rice in cold water. After 8 minutes, the chicken should be almost cooked. Remove the cooked meat to a bowl and roughly measure how much liquid is left behind. Mine had about 1.5 cup of liquid. Just measure roughly. It need not be accurate. Measurements used – 1 cup rice = 250 ml. We are using 2 cups rice and 750 grams meat. We require 2 times water to the quantity of rice. So we need to add 4 cups water. There was already 1.5 cups gravy that we measured before. So I added 2.5 cups water to the mixture. Let the mixture come to a boil. I cooked the biriyani in the pressure cooker. 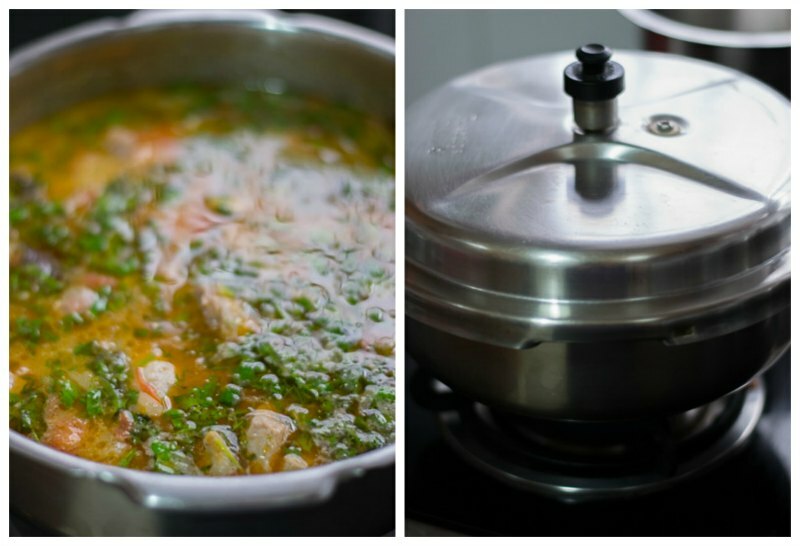 If using pressure cooker, cover the lid and cook for exactly two whistles. Approximately 4-5 minutes. If cooking directly on the pan, then cover the pan with a lid and let it cook for the first four minutes on medium flame. Open the lid. Gently mix once from the bottom, cover the lid again and simmer for 10 minutes on very low flame. Add or reduce green chillies and red chilli powder according to your taste preference. If you do not want it spicy, omit the green chillies. Always use chicken with the bone. Bone has a lot of flavour. We use skinless chicken for the biriyani. I already tried this recipe and really helpful to make tasteful briyani for my lovely wife. You can just double or triple the recipe and it works just fine. Mam I added a bit of ghee as well to this recipe. The biriyani was awesome. Thank you so much. Superb recipe. All d credit goes to you. But flavour will be diluted. You can double all the ingredients if you want to have more. Do you have any recipe for Ambur Chicken Biryane, am sure the mutton recipe cannot be used for chicken. You can use chicken but reduce the cooking time. Hi, The recipe turned out super good. My kid loved it. Thank you so much. Why do you use peanut oil? Any particular reason? Thank you! Peanut oil is traditionally used. Sunflower oil was not heard of 40 years back! Yes you can do with seeraga samba rice. Water proportions for basmati and samba are the same. Hi..this recipe sounds wonderful..can’t wait to try it..is it possible to adapt the same recipe for mutton biriyani? probably pressure-cook the mutton in the gravy, then measure the gravy and follow the rest of the procedure in the same way as for chicken..would that work? thanks! hi Lex, Yes. What you said will perfectly work. Hope you like it. It looks yummy and i am going to try it ! It looks yummy and i am going try it ! Hi, I tried this recipe couple of times and I never got it right . There was no chicken biriyani’ aroma , I felt the spices used is meagre. Good Recipe..I have a doubt if I’m doing it in Pan how many minutes do I need to keep..If it’s in pressure Cooker hw many whistles needs to come..
Hi Mam…i have tried as ur instruction..it came out very welll…i fo have a doubt!!!! 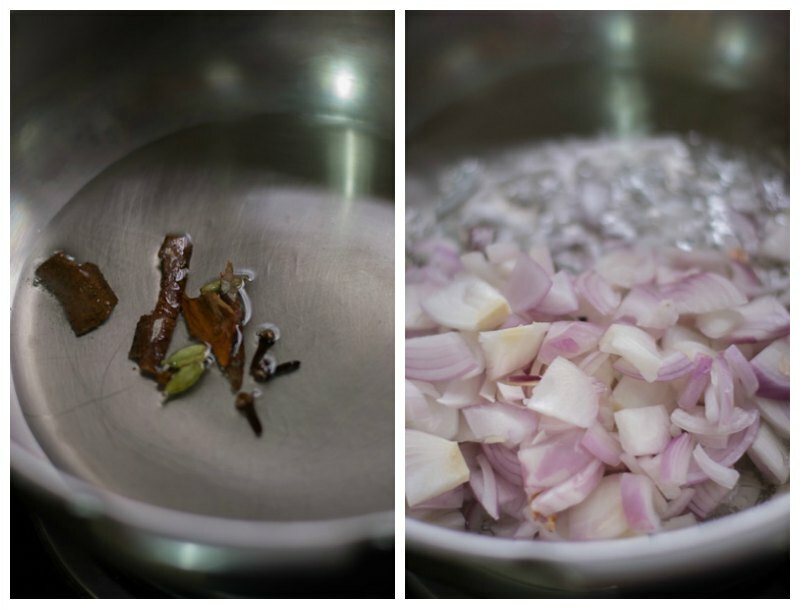 !.usually hotel biriyani or muslim biriyani preparation has special aroma….classic smell…but at home it’s not up to the mark….Wat to do…Wat and all need to add extra..
Hope you can solve my doubt…. Thank you so much for the posts. Love your recipes!! I could feel the taste of the recipe while reading itself . You are super I used to try many recipe of yours and many came out well . Thanks for that . Whenever I try anything I used to make wrong in salt measurement only so can you pls tell how much salt should be used in this. 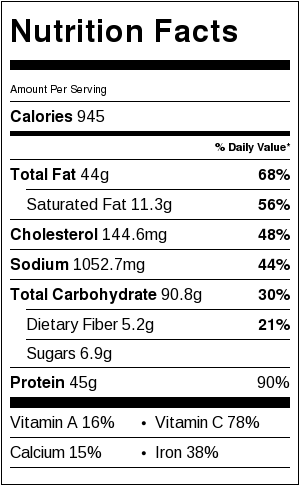 Salt measurements are given in the ingredients. Please check. Yes mam thanks . I forgot to see that . Can we prepare this in induction stove? In a non stick towards? Yes you can try this in an induction? I did not get the second question. Can you type that a lil elaborate please!!!!? My husband loved it.. Thank u so much? Hi kanamma, thanks for posting. When I go to Rahman Biriyani the Biriyani brinjal that they serve there is excellent. Can you post that recipe if possible. Super taste. Thank you for the recipe. Thank you for trying out the muslim style biryani. Glad you liked. Made this twice during the week and it came out delicious. Thank you very much,You are simply amazing. WOW! Thank you so much. Really glad that your son liked it Thenammai. Looks like you cooked it perfectly. Happy cooking! thanks a lot ma’am for sharing this recipe..!! when i got married n moved to U.S I kind of learnt to cook all our south indian cuisines and even tried out other cuisines but BIRIYANI!!! i always ended up doing something wrong! especially cooking the rice! i always got it wrong ! i kept trying ! and finally stumbled upon your blog! n finally i got to make good biriyani! thanks a lot! Hai Mam…Can i use sunflower oil/ghee insted of using peanut oil? Hai it was really simple and delicious also . Thank you so much Pal. Thanks for letting your friends know too! Appreciate it! Hi suguna, I had prepared this biryani for guests who loved it very much…It was so simple to make and very yummy to eat…gonna try your ambur biryani this weekend. ….but I am planning to use basmati since my hubby is not a big fan of zeeraga samba rice…. Thats so nice Sona. Really happy that you liked the biryani. Its my favorite too! Can the fresh coriander and mint be ground into a paste and fried with the rest of the masala? Would it give the same taste as using fresh coriander and mint leaves? The ground paste might change the colour of the biriyani. If you are going to grind it into a paste, you need to fry them along with ginger garlic paste to get the raw smell out! The taste will be slightly different. All your recipes are great. Can u please suggest which rice ( basmati or seeraga samba ) to be used for thahira’s chicken biriyani. Hi! Had tried my first biryani with your recipe. I found the recipe very simple and easy to do. The best part is I got the biryanis just the way I wanted-non greasy without much masala. My kids loved it. And they keep asking me when I would do it for them again. Thank you and keep it up! Thats so cool that your kids enjoyed it! Really glad Kailas. You made my day! i added salt when we had for dinner , it tasted awesome.thank you. Tried this exactly the same way mentioned above. Turned out pretty awesome. Many thanks for sharing the recipe. i did this recipe today, it came out good but the flavor was less . Can you tell me remedy for that. what ingredients should i add more to get spicy and good flavor. Please post the recipe for brinjal curry used as sidedish . Eagerly waiting or your reply. Thank you for sharing the receipe. I will post dalcha recipe soon. You have a lovely blog. 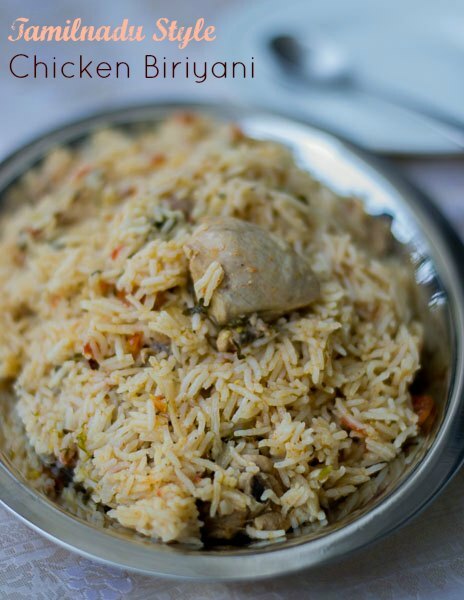 I have never cooked chicken and want to make this briyani. Could you please tell me what kind of chicken I should get here in USA. I see bone in is better for briyani. But most bone in has skin on it. Is that okay? When it is skinless it is also boneless. Also should I get chicken breasts, tenderloins or thighs? Please suggest which is better. Just get chicken with bone. The skin will easily come off when you clean. Just pull it off and it should peel off in no time. Chicken thighs taste well for biryani. Ask the shopkeeper to cut it into 2-3 inch pieces for you. Places like wholefoods etc… will cut the chicken for you. I want to tell this as you are saying that its your first time. Hello kannama, Thanks fa dis recipe. It came out excellent. Taste was awesome.. My husband is very happy.. Please post more recipes like this. Hello kannamma thank u so much for d recipe… I tried it today n came out exactly d way it’s in ur pic n tasted delicious… just followed ur instruction wic was very clear n helpful.. my first time 100% perfect biryani ever… I’m so happy thanks a ton. Hello kannamma thank u so much for d recipe… I tried it today n came out exactly d way it’s in ur pic n tasted delicious… my first time 100% perfect biryani ever… I’m so happy thanks a ton. Thats so nice Smitha. Here is my cheers for many more perfect biryanis in the days to come ! Thanks a lot and ur instructions steps are very helpful l. The briyani camed out very Tasty and first time in my cooking the bottom food did not burnt. I cooked in pan. Thank you so much for writing in Nabil. I am glad the biryani came well. Happy cooking. Hi there. First time ever gonna try to cook briyani. Just wanna clarify if I gotta cook it in the pressure cooker over medium flame or high flame? Do I have to turn off the stove exactly after 2 whistles? Here are some points that might help you. # Yes. If using pressure cooker, cover the lid and cook for exactly two whistles on medium flame. Approximately 4-5 minutes. You have to turn off the stove exactly after 2 whistles. Wait for the pressure from the cooker to release naturally. That is very important. # Also please soak the rice when you start to cook. Let me know how your biryani adventure turns out! The biriyani came out very well..loved the recipe.. Thank you Keerthana. Yeah. Its one tasty muslim biryani! You are amazingly true friend of Thahira. May almighty God bless you and your family.